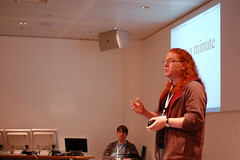 You are currently browsing the Christian Heilmann blog archives for February, 2008. One of the biggest podcasts in the UK when it comes to web development and web design is Paul Boag’s Boagworld.com. Every week Paul talks about what’s hot and happening in the development world and mixes it with good humour and believable insights. This week’s podcast is entitled “Hiring” but ends with an interview Paul did with me over Skype on Valentine’s. If you listen to it, you’ll hear that I did have a cold and it was a long day, and if you read the transcript, you’ll see that both Paul and me “um…” a lot. Nevertheless Paul had some very good questions, and I hope I had interesting answers. I just came back from a packed De Hem’s pub in Covent Garden where quite a bunch of people came around to celebrate the 2nd birthday of the YUI. Here is a talk I just gave at an internal SEO conference about the overlap of SEO and Accessibility. The main consensus is that if you look at it closely, the two are really trying to solve the same problem, most of the time our approach is what makes it tricky.